You don't need to be Dutch to ride this bike! Forget what you think you know about front loading Cargo Bikes or bakfiets; this Front Loader is like no other. 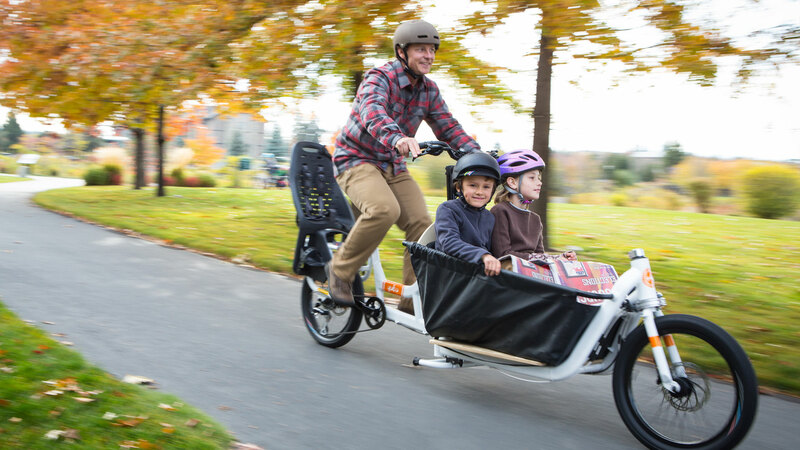 Specifically designed for active parents and small business owners on the go with a low step through frame design, adjustable cockpit and ultra smooth steering. It’s easy to ride from the first turn of the pedal and sturdy enough to stand up to your busy lifestyle. Keeping with our cargo roots, we also included a Yepp compatible rear cargo rack for all the extras. Now you can literally bring everything AND the kitchen sink. We think that sums it up perfectly. We replaced that clunky steering arm you see on other front loading Cargo Bikes with more practical, rider friendly cable steering design. The dual cable steering, extra low front cargo rack and 90 degree steering radius adds up to a powerful cargo hauling machine that steers like butter and turns heads everywhere. Configuration: “(almost) the full package”. Bamboo base board, bamboo box, seat kit, canopy, frame lock, cargo straps, aftermarket back wheel hub engine. The only accessory we didn’t add is the Yepp Maxi back seat. Usage: Year round main transportation vehicle for a small family with no car living in a hilly city. Family size: Two adults and one five year old. Location: Seattle, US (those hills!). Previous experience: For two years a Babboe City E electric front loader was our year round main transportation vehicle in Oslo, Norway. The average daily distance covered was 10-15 miles. We have also used a Butchers & Bicycles MK-1E daily for a period of 6 weeks. The MK-1E is a tilting three wheel front loader that is roughly in the same class as the Yuba Supermarché. I have also test ridden several other models from Workcycles and Riese & Müller. 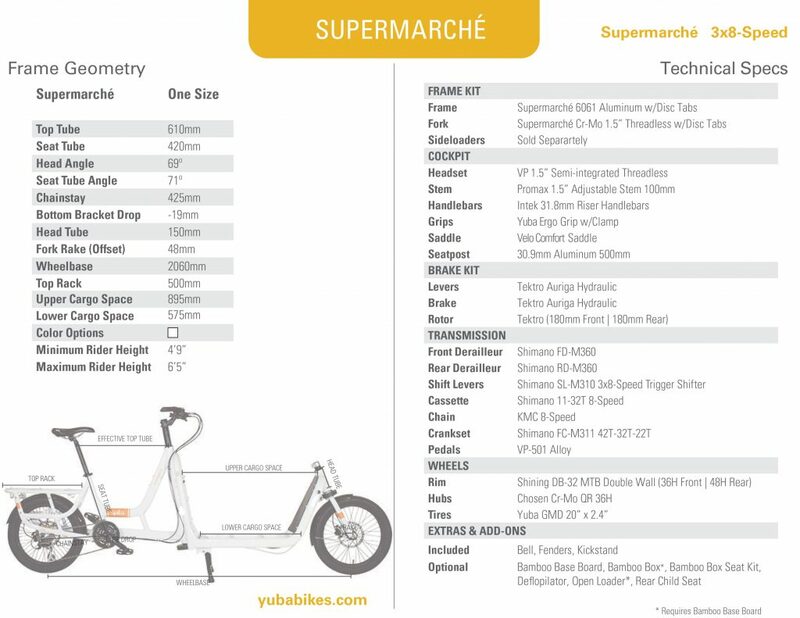 Disclaimer: This review will be colored by that the Yuba Supermarché is in a higher class than the Babboe City E, and so most comparisons will inevitably be favorable to the Yuba. Still, I’ll do my best to keep it objective and informative. We have now owned the Supermarché for five weeks, and during that time it has been in daily use. – It handles extremely well thanks to a low center of gravity, wide tires, good stiffness and responsive cable actuated steering. You can actually fight your way up steep hills standing up on this bike, which is not really true for many cargo bikes due to handling, weight, and frame geometry. It feels dead stable even when going down hills at over 35mph. – It’s comfortable to ride thanks to wide tires and good frame geometry. – It’s very light for a front loader, only about 60lbs/27kg (not sure how much weight is added by the accessories but ours is fully decked out and still feels relatively light. Lifting up the rear of the bike won’t break your back). – It comes with front and rear hydraulic disc brakes, giving you good stopping power even when carrying heavy loads. 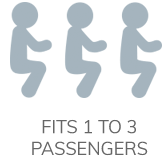 – The adjustable seat height range is large, so it will fit most riders. – The bamboo box is sturdy and holds up well to kids climbing in and out. – The canopy keeps the weather out, doesn’t get in the way of either the handlebars or the passengers’ heads, doesn’t obstruct the rider’s view (with the exception of a foot or so of ground in front of the bike), has decent visibility for the passengers, and has plenty of ventilation options. – The canopy and its support structure are very easy to mount and dismount, it takes me about 3 minutes. – The canopy (but not its support structure) can easily be dismounted and packed away on the bicycle, and you can keep riding with only the support structure mounted. – The bamboo box can be dismounted to allow for carrying large items. 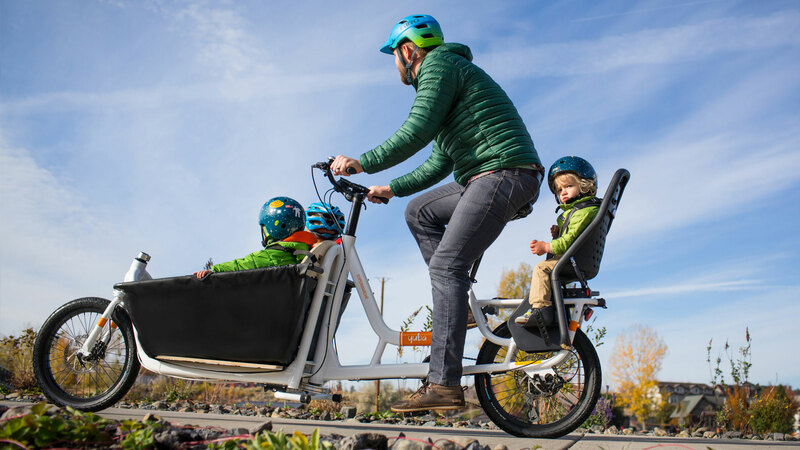 – The bike is certified for more weight than most other cargo bikes. – The double kickstand can be a little awkward to get down into supportive position, especially when the bike is heavily loaded. A peg on either side of the kickstand would help a lot. – The bamboo plates creak slightly when the bike moves. – The frame lock has a storage location which, depending on your foot position on the pedals, can get in the way of your heel when pedaling. – The canopy uses velcro fasteners which seem somewhat flimsy. I’m a little worried about the durability of these, but time will tell. – The canopy support structure doesn’t fold or dismantle easily, so if you’re out riding with it mounted you won’t be able to pack it away anywhere on the bike. – The rear rack is quite low and its tubes are unconventional, so the selection of panniers (bags) that will fit is limited (but they do exist). – The space in the bamboo box is somewhat limited due to its narrowed front design. Make sure it can comfortably fit what you need it to carry. – Like most two wheeled front loaders the Supermarché is very long. Make sure you have the space to park it, preferably in a safe and sheltered spot. – Bikes are different and fit different people in different ways. I highly recommend thoroughly test riding several bikes before making a choice. – If you’re going to be using the bike in a location with steep hills then electrical assist may be preferable. The native Electric Supermarché available from Yuba however is more than twice as expensive as this non-electric version. If that’s too expensive for you (like it was for us) then adding an aftermarket engine to the non-electric version is a viable and more affordable option that we are very happy with. Be aware however that to my knowledge only hub motors are compatible with the non-electric Supermarché, as opposed to the crank motor the native Electric Supermarché is equipped with. Also, the native Electric Supermarché comes with several upgrades to the components and frame over the non-electric version, in addition to the motor itself. Conclusion: After two years of using a more entry level front loader the quality of this bike really stands out to my little family. In my opinion the only thing missing for this to be the perfect front loader is suspension, but that addition would probably have increased the price significantly. We absolutely love this bike and highly recommend it. It’s a dream to ride, it feels safe, it’s comfortable, and it performs very well. My new Supermarche is surprisingly nimble, even at low speeds. Once riding the bike feels very solid and stable. The fat tires give a comfortable ride. The gearing is better suited for pushing weight rather than speed. It clears speed humps and other obstacles well. My toddler enjoys riding in the bamboo tub with bench, and there’s plenty of room left over for other supplies. We bought our first house and a new Supermarche this spring and are so happy with both of them! We love riding with our two small children in the front with plenty of room for cargo on trips to the beach, pool, store, market, parade, or just about anywhere around Chicago we want to go. It’s a great bike. I’ve been using it to commute, take the kids to school, and for runs to the grocery store. I live in a pretty bike friendly area with good infrastructure, so having the Supermarché works out great. Definitely the most fun and practical bike in the stable. Hauls kids, groceries, hardware store runs, and whatever else you can think of. The low center of gravity allows it to handle exceptionally at low and high speeds. Spot on gearing and brake selection for my location (some hills). This bike will change your life. Great bike! I’ve saved at least 24 car trips downtown by having this. I’ve carried air conditioners, a dishwasher not to mention friends around town. Handles great and can really move! 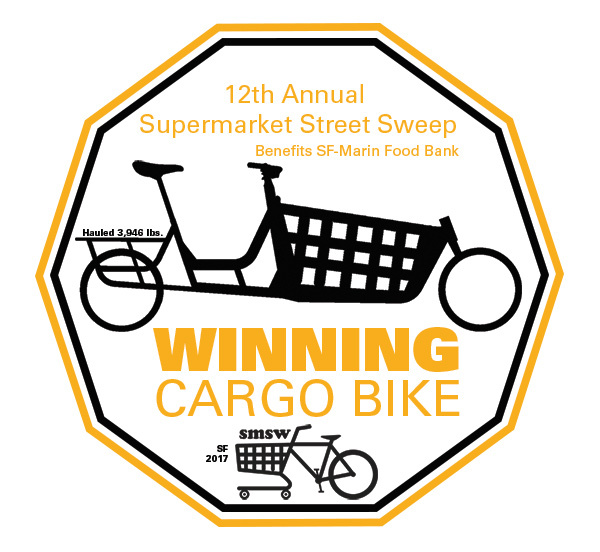 Bring the entire supermarket with you! 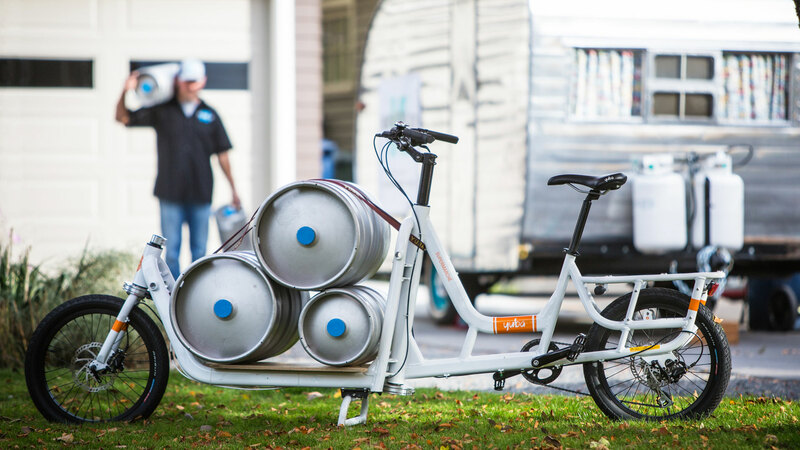 This front loader cargo bike can comfortably haul everything from kids to kegs and leave you feeling like a boss bicyclist. With smooth dual actuated cable steering, 90 degree steering radius and an extra low cargo rack, hauling 300 lbs. 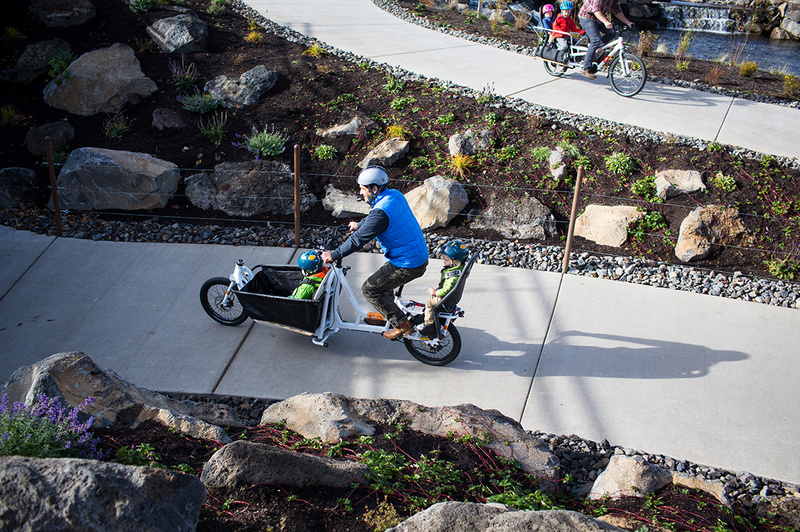 by cargo bike has never felt so natural.